When the first Assassin’s Creed game came out years ago, I honestly didn’t think much of it. I thought it was an enjoyable game but nothing I’d really want to come back to. I never imagined it would become one of the biggest franchises in gaming history. I have played most of the games in the series, aside from Black Flag and Unity, but I wouldn’t say I became a huge fan of the series. Well that changes now. Here we are in 2018 and Assassin’s Creed returns once again in Assassin’s Creed Odyssey, the second game in what I personally am calling the “reboot” series, starting with Assassin’s Creed Origins. 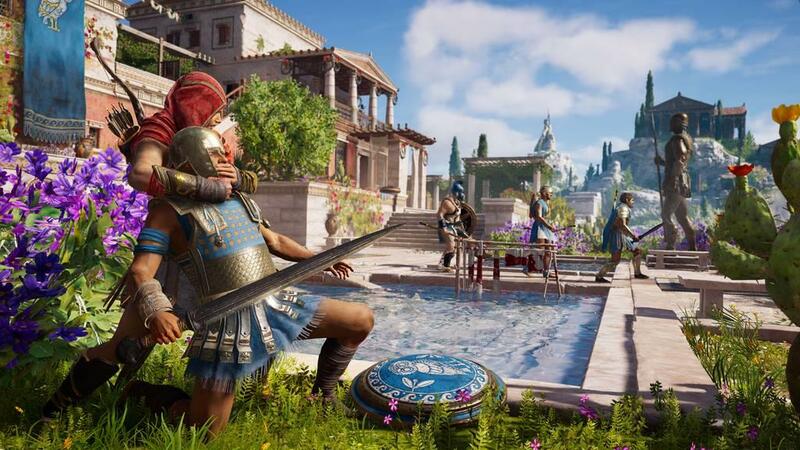 If this is what the series is, then the series has an even bigger future ahead of it, because Assassin’s Creed Odyssey is not only arguably the best game in the entire series, it’s absolutely one of the best games of the year. 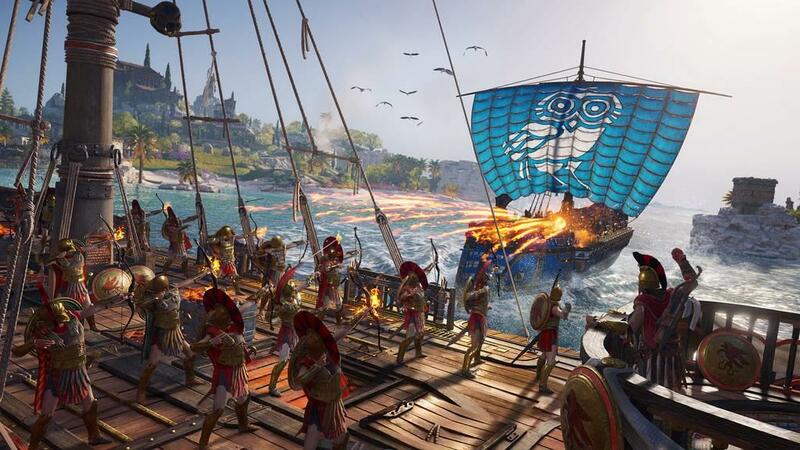 This time around, Assassin’s Creed has players traveling to ancient Greece during the Peloponnesian war between Athens and Sparta. You can choose to play as either Kassanda or Alexios, mercenaries who are also descendants of King Leonidas. Through flashbacks we see your sibling was chosen to be a sacrifice by being thrown off a cliff and you tried to stop it, with the result unfortunately being that you ended up sending both your sibling and another man off the cliff, murdering them both. You are then immediately sentenced to death by being thrown off the cliff as well. You of course manage to survive and, many years later, your Odyssey beings with you setting off into ancient Greece to find out what happened to your family. The first thing that took me by absolute surprise was just how massive this game world is. Imagine my shock when I kept zooming out from the map to see that the area that I started in was just the tiniest of blips on the entire world map. The world is absolutely gorgeous and this is a perfect example of the kind of game where you can just roam around for hours and marvel at world around you. 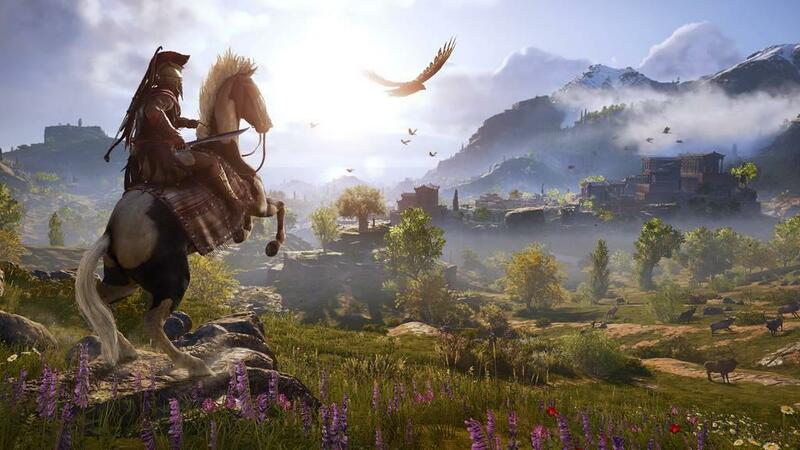 From beautiful mountains and oceans to towns bustling with people to wooded areas teeming with wildlife, Ancient Greece feels alive and just as much a part of game as the story that goes along with it. You can travel the world as you see fit. Either on foot, by horseback or by sea, and the game will let you know what the recommended player level is for each section of the map. This way you won’t go wandering off into a place where you will just get immediately decimated for not being leveled high enough. Along with the world itself looking beautiful is the number of NPC characters and some great voice acting. The people you meet along the way are all brimming with personality. From your shipmates to NPC quest givers, you want to stay and get to know them more, you want to listen to their problems and you want to help them out. There are also day/night cycles and weather as well. You could be sailing the sea in calm waters with not a cloud in the sky. Other times, Zeus and Poseidon's wrath will reign down upon you as you will be sailing in heavy thunderstorms and raging seas. 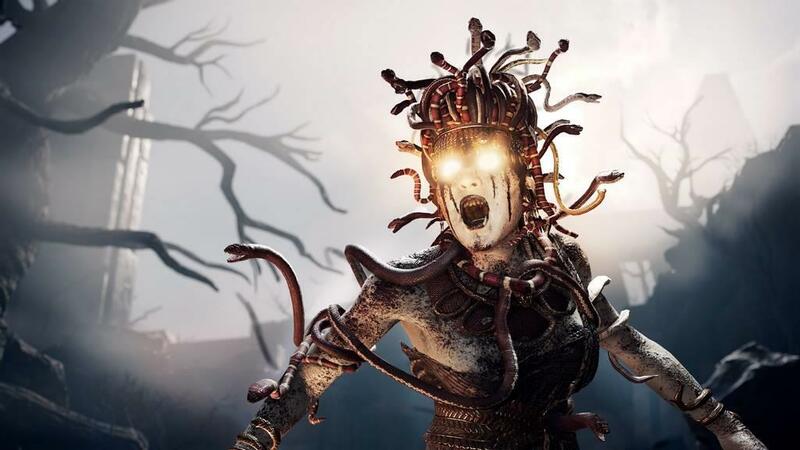 Assassin’s Creed Odyssey has a big focus this time around on role-playing elements. Practically everything you do in the world will earn you XP which can be used to purchase abilities for your character. Separated into three categories—hunter, warrior and assassin—you can purchase abilities to suit your preferred way of playing. You can focus on the hunter skill tree which can turn you into a deadly sniper with a bow and arrow. Or the warrior tree which turns you into a skilled combatant. Or the assassin tree which is helping for sneaking around and assassinating enemies. This also ties into the gear you wear and the weapons you wield. Gear is broken down into headgear, torso, arms, legs and feet. Each piece of gear you equip will increase or decrease your attributes like health, armor, damage, etc. Your inventory will fill up quickly, so it's good that you can sell gear you don't want for currency or dismantle them for upgrading parts. Regardless of whatever abilities you decide to purchase, you always need to leave room in your arsenal for probably the best and most important ability of them all. That, of course, is the Spartan Kick ability, which I expect to be at the forefront of many memes and compilation videos in the months following the release of this game. Why? Because it’s amazing and is worth the asking price of the game alone. Kicking enemies off cliffs or off ships in naval battles never gets old. It’s also an effective method of cheesing your way out of fights if you get into trouble. You could have an enemy come after you that is two levels higher that will take you down in a few hits, but the laws of gravity bend for no man, and a single Spartan kick off a cliff or a high location can instantly finish off an enemy. Combat is fun and challenging at the same time. You can't go into battles just mashing buttons or you will just keep taking damage. You need to watch your opponents, time your attacks, and make sure you are dodging when you can. If you see your opponent glowing red it means they are about to come at you with an unblockable attack so you will need to dodge. If you dodge at the right moment, time will slow down allowing you to unleash a barrage of attacks for a short amount of time. You can also parry enemy attacks by pressing L1 and R1 at the exact moment an enemy attacks you. Doing this allows you to attack them with a free hit which which will deal extra damage. I also recommend grabbing the skill which allows you to strip enemies of their shields because these enemies are the ones that will give you the most trouble, especially if they are attacking in groups. There are a variety of weapons to use in the game including swords, daggers, axes, long staffs and spears, each of which controls differently. Personally I enjoy the long axes and daggers. Daggers are quick and are great for inflicting damage over time with poison or fire attacks, and the axes are great at long rage and can deal heavy damage to multiple enemies. Speaking of combat, since you are a mercenary, and depending on what part of the world you are in, you will be working for both Sparta and Athens and what you do in the world all leads up to the epic conquest battles. Attacking strongholds, killing soldiers and raiding bases will all lower the defenses of either Sparta or Athens. By attacking a nation enough, you will then be able to participate in the huge conquest battles. Conquest battles are huge brawls with hundreds of characters on screen at once. The goal of the battle is to kill enough enemies to drain your opponent’s life meter at the top of the screen before yours does. You have two choices when it comes to conquest battles: defend or attack. Depending on what part of the world you are in, this will also decide what faction you fight for. For instance you may choose to defend Sparta against an Athenian attack or you can choose to fight for Athens and then try to attack and conquer an area controlled by Sparta. Choosing to attack or defend is pretty much a risk vs. reward situation. Defending an area is always the easier option, and should you succeed you will earn one piece of epic gear. Attacking an area, however, is much more difficult but, should you succeed, you will be rewarded with two or more pieces of epic gear. Enemies are stronger when attacking and, of course, mercenaries like to show up to the battle and are pretty much there to waste your time. Since they are harder to kill, it just means that your side's meter will be draining faster. Conquest battles are a fun and easy way to earn currency and gear. Once a battle has been finished you can choose to play through it again after a certain amount of time has passed, since the game world is always changing as you play. Speaking of the game world changing, one of the big selling points of Odyssey is the fact that your choices will have an impact on the story and the world itself. While this is true for the main story, the world itself doesn’t really see too big of a change depending on the choices you make. For instance, some smaller choices you make earlier in the game will have an impact way down the line when you talk to someone and they bring up the choice that was made earlier. There are even some options you can take which may not seem insignificant but can have an impact later on. For the sake of spoilers, I can’t delve too much into the choices, but there is one that I want to bring up. This one was part of Ubisoft’s official video series on YouTube about Odyssey. At one point you will find a village that has been burned down. All that is left is a family that is about to be executed because they carry the plague and the soldiers don’t want it spreading around the city. You can choose to execute the family (small children included) or let them go. In the video, Ubisoft decided to let them go and of course more people died because of them. Now in my play though, I decided to have them executed because, of course, I didn’t want the plague to spread. Later on in my playthrough I was yelled at because I allowed innocent people to be executed. Wait what? So were they infected or not? You can easily see the main story implications as you play through, but it's hard to really see just how your smaller choices can truly affect the world without playing through twice. There are also romance options, but I don’t really have much to say about them because I didn’t really bother with them. They seemed really shallow and tacked on. You can meet someone and then the next minute you are telling them how beautiful they are and how you want to get into their robes. No subtlety whatsoever. 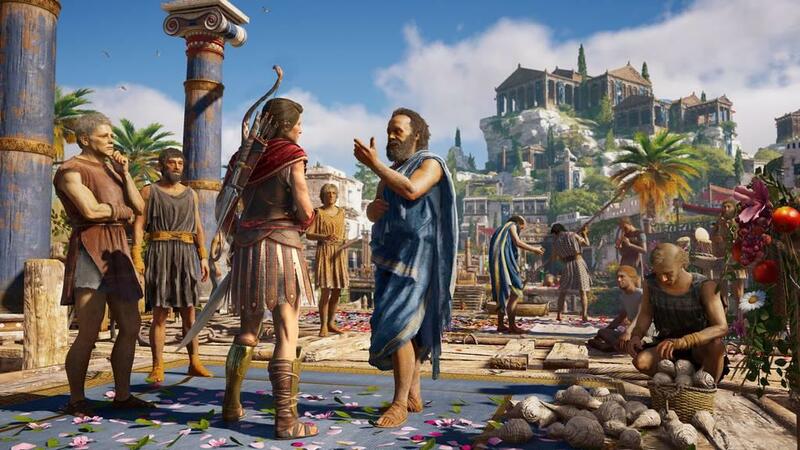 The main story in itself can be quite the journey, but just when you think you have seen all there is to offer in Odyssey, another whole story arc opens for you. This story path revolves around a mysterious cult that has been coming after you and you decide to hunt them all down and eliminate them yourself. Now, I cannot talk too much about the cult because it contains massive spoilers, but this in itself could have been an entire game alone. You start out by only knowing a few of the cult members and have to find clues around Greece to unmask the others. Clues can be found in forts, on enemies, or by talking to NPC's in the game world. Tracking down these people is fun, as they offer a challenge and are a great way to acquire pieces of epic gear. As I mentioned before, the world that Ubisoft has created is both beautiful and huge at the same time. Players are given the option of playing in Exploration mode which removes most of the information about where you need to go during missions, leaving it up to the player to discover it themselves. I highly recommend playing in this mode. When you have a mission to complete, you will have to talk to NPCs to get information on where you need to go. The information you get will usually be a general location, like telling you that your target is in the southeast section of a certain region. If you look on the map, you will usually see question mark icons in that area, meaning it's something you haven't discovered yet. It’s enough information that you will know where you need to go, but it’s not so little information that you be left wandering around like an idiot not knowing where to go or what you are supposed to do. Exploration mode also leads to big surprises as well. Not since Legend of Zelda: Breath of the Wild have I played an open world game where I was just in constant awe as I wandered the world and kept discovering new locations, boss fights and treasures. You may be wandering around and, all of a sudden, you will stumble upon the lair of an Alpha animal, which are giant animals that are incredibly tough to defeat and can kill you rather quickly. You may be wandering around and stumble upon caves which contain tons of loot and treasures. You may also stumble upon caves that are bandit hideouts that you can raid for more loot and treasures. You may just get into a fight with a random person and find out that they had clues on them to uncovering more of the members of the cult. One time I found a random cave, defeated all of the bandits in the cave, and one of them was the member of the cult themselves without me knowing. There are endless moments like this in the game that take you by surprise and make it a ton of fun to play. Another factor to take into consideration when you are traveling around the map is the Mercenary system. When you commit crimes such as murdering innocents, stealing, killing animals, sinking boats, etc., your bounty level will begin to rise. Somewhat like the Wanted level in Grand Theft Auto, the more crimes you commit, the higher the level and the more bounty hunters that will be coming after you. I enjoy the system because it keeps you on your toes at all times as bounty hunters are a much higher level than the player, but the execution of the system is a bit flawed. The main problem I have with the system is that bounty hunters can literally just spawn out of nowhere and almost always will spawn near you, which can ruin a mission if you aren’t careful. Multiple times I was sneaking around a fort trying to loot chests, burn war supplies and kill generals, and then all of a sudden the whole thing is ruined because a bounty hunter just spawns in the area and spots me. Of course since I was spotted and forced into combat, the entire base goes on alert and comes after me. You could be in some kind of underground cave and bounty hunters will still spawn near you. Even if they are the same level as you, the bounty hunters are some of the most powerful foes in the game, and it’s much easier to defeat them in a one-on-one fight than in a group. The one thing that I do like about the system is that when you kill bounty hunters, you then take their spot on the mercenary list and thus you can collect bounties on your own. By visiting the information booths in most towns or by talking to certain people, you can then go out and search for people to kill yourself. It’s a fun and easy way to collect drachma and other supplies. The best part of the game in my opinion, however, are the naval battles. While you are out on your ship you will run into warships from both Sparta and Athens and can engage with them—or you can leave them alone. It's also very cool and immersive to be sailing by and seeing ships battling with each other in the background. You can attack pirate ships as well. With resources found throughout the world, you can upgrade your warship. Here is a tip: upgrade the rowers' speed and stamina first. When you first set out with your crew, it’s going to take forever to travel long distances because you can only get a short burst of speed before waiting for the stamina bar to fill up again. You will also need that speed when it comes to battles as ramming other ships. You can upgrade the cosmetics of your ship as well. From the ship itself, to the type of crew you want on the ship can all be bought and changed from the in-game store with Helix credits. There are some free cosmetics available by logging into Uplay and you can spend your Uplay points on cosmetic options as well. If you don’t care about immersion at all, you can even spend Uplay credits to have Evie Frye from Assassin’s Creed Syndicate to be one of the crew members who will fight along with you in battle. Battles are fun and intense with you commanding your crew to launch javelins and arrows at enemy ships. You can even ram into them for damage. Once the ship has been fully damaged you can either ram the ship to instantly destroy it, or you can board the ship to collect extra loot. When you choose to board, your crew will jump over to the enemy ship as it's sinking. Then you have to defeat everyone on board to be declared the winner. Once you do you can loot the chests, jump back on your own ship, and watch their boat slowly sink into the sea. Amazing stuff. Navel battles are also a great way to farm resources, especially wood which is used in most of the upgrades in the game. 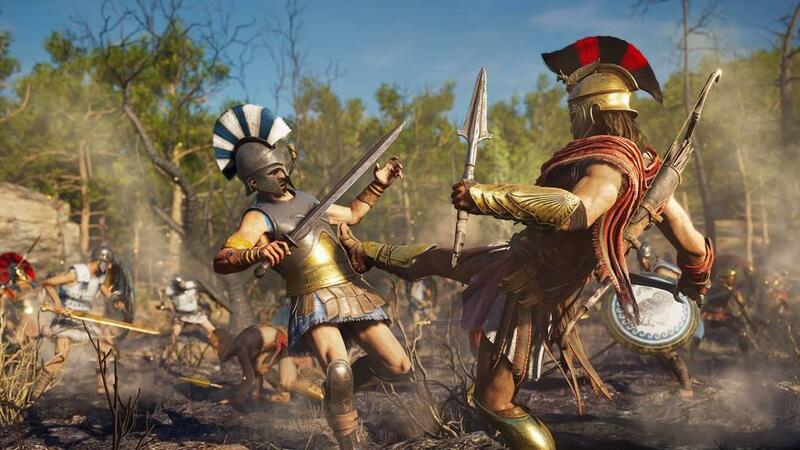 Playing through Assassin's Creed Odyssey it's clear to see how much time, energy, passion and care went into creating this game. 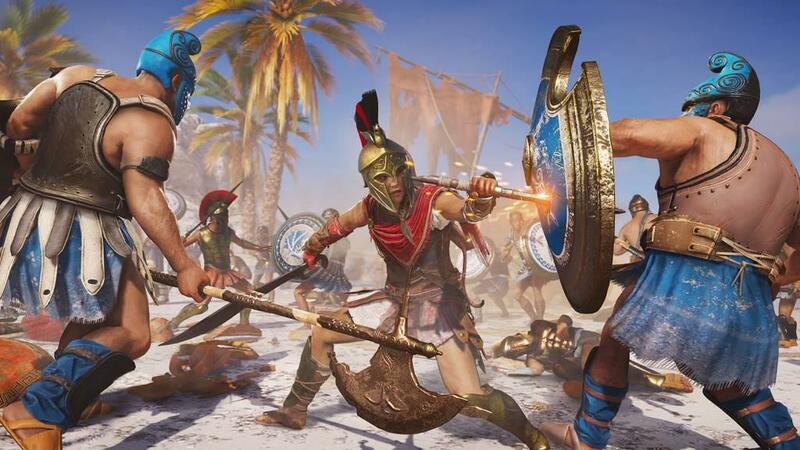 Assassin’s Creed Odyssey truly is going to be an odyssey for everyone that plays it. It’s an absolutely massive game that is packed with tons of things to see and do and will keep everyone playing well beyond the point of when they finish the main story. With a massive world, tons of fun missions, and an intriguing story, the game guarantees that there will almost always be something to do. I can see myself playing this game until the next Assassin’s Creed.